Compatible with all E-16D models. 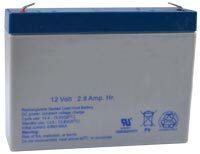 Absorbed Glass Mat (AGM) sealed lead acid battery provides high performance. Valve regulated, spill proof construction allows safe operation. Dimensions (WxDxH) in: 5.19x1.32x3.82 (132x34x97 mm).